Just before our Toyota pick-up set off, a local middle-aged man told my friend who had organized our trip, “Sorry, I can’t join you, but our platoon commander will accompany you up there. Nothing to worry about.” Then, a cheerful, stout man in his 20s wearing camouflage pants and a blue jacket with a pistol jammed in his belt jumped onto our four-wheel-drive truck and we were off. We were in Cebu, a village about three hours’ drive from Loikaw, the capital of Kayah (Karenni) State in eastern Myanmar. Though it is located in Shan State, almost the entire population of the village is Kayan, a Karenni subgroup. Encountering such a village is not unusual in Myanmar—it simply demonstrates how diverse the country is, with its different regions that are home to various tribes and religious groups. The Kayan are legendary for the bronze rings worn by some of their “long-necked” women. Our pickup truck was now gearing up to climb a narrow road into a village, with rocky mountains on our right and a steep abyss to our left. The cool mountain breeze coming through the windows kept the air inside the vehicle crisp, and the green hills made for a refreshing sight. 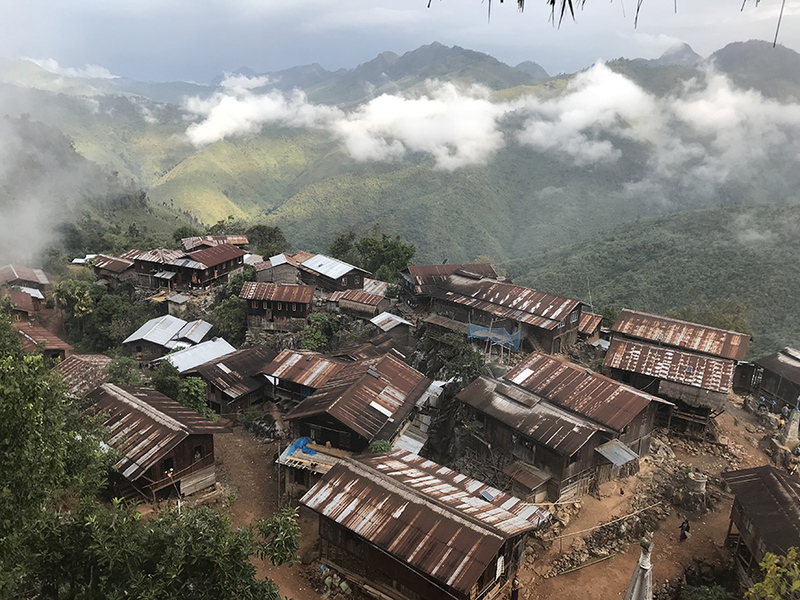 Without the presence of the platoon commander from the Kayan National Liberation Army (KNLA), however, we wouldn’t have been able to drive up to the village, as it is located in the ethnic armed group’s territory. The KNLA signed a ceasefire with the previous military regime in the mid-1990s. On the way to our mountainous destination, any worries we may have had began to seem unfounded. The view was scenic, the road rough and steep, the weather pleasantly chilly, the situation peaceful. On the way, our car had to stop twice at makeshift bamboo gates; the platoon commander briskly jumped off to open and reclose the gates—there were no guards or other signs of military presence. It did not feel to us inside the car that we were in rebel-held territory. The area is no longer an active military zone—unlike two decades ago. Our trip had a single purpose—to explore “virgin territory” as domestic tourists. “No more fighting these days,” he continued. In his 50s now, he is clearly a happy family man living with his wife and daughters. My friend told me he is the best chef in the village. That certainly seemed true but his wife’s dishes of boar meat were also amazingly tasty. All Kayan dishes have a unique flavor, thanks to the use of locally grown Matkhar pepper, which makes your tongue slightly numb; their heat is reminiscent of Szechuan peppercorns. 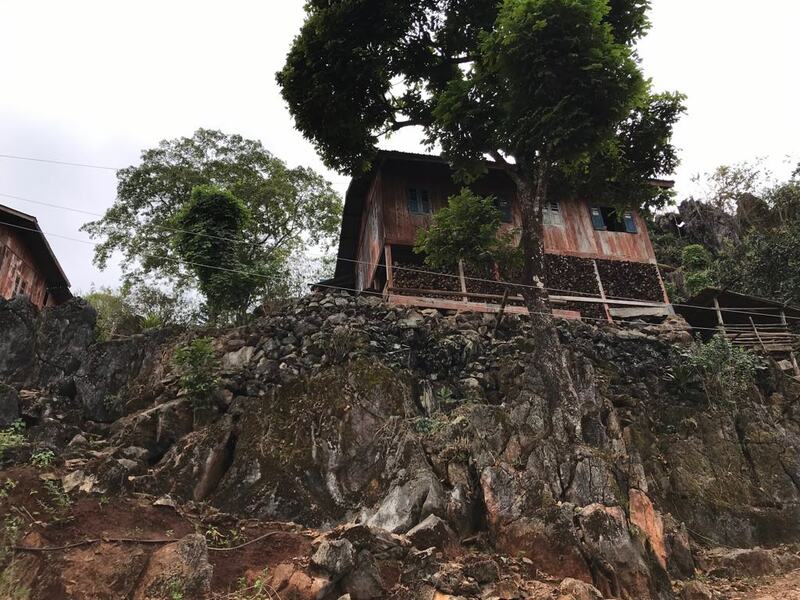 Today, Cebu is still a stronghold of the KNLA and its political wing, the Kayan New Land Party, whose headquarters are located in this village. In a grand Kayan mausoleum near the headquarters, their late leader U Shwe Aye is buried. He founded the KNLP in 1964, two years after the dictator General Ne Win staged a coup and began his iron-fisted rule of the county, which included repressing ethnic peoples’ rights in remote areas like Kayah State. After driving up and down several mountains for an hour-and-a-half on a dirt road, our lunch host pointed out that our car had reached its destination, Rankhu Village, which sits around 4,000 feet above sea level on a peak surrounded by other mountains. 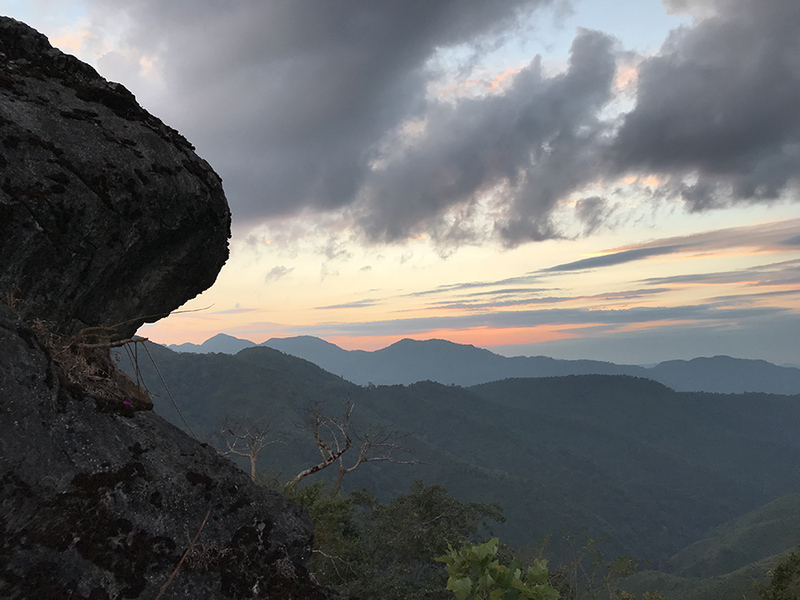 “Rankhu” means “rocky”; residents said the village was built 300 years ago on the mountain as a refuge from tribal fighting and natural disasters. Our jaws dropped to see the way the houses literally perch atop rocks and large boulders. The entire village was built up among and upon rocks and boulders. There are about 60 households in the village, whose population is just over 300. All are Kayan, but they belong to various sub-tribes. Almost all are Catholic. The children and other villagers seemed to be expecting us, and flocked to the center of the village when our vehicle pulled up. Smiles beamed from every face. It was almost sunset, so our group climbed to the central point of the village, which is elevated above most of the homes. At night, some of the senior villagers, including bishops, mostly middle-aged, came to converse with us. They said many of the other villagers had wanted to come up and talk, but they had told them not to disturb the guests. Much of the conversation was focused on what they can do to develop their village, whose livelihood is based entirely on agriculture, especially rice, chilies and a few other crops. They said they were interested in developing community-based tourism, which they believe has potential as another income stream for the village. They are eager to embark on the kind of development they see occurring in other, better-connected villages. The conversation barely touched on politics. They were the perfect lyrics for this moment, encapsulating my feeling of floating serenely among a sea of cloud in a space with no heaven above and no hell below. Looking down on the village from this point was so tranquil. The message of “Imagine” was enhanced by something I had noticed since arriving in the village the previous day: the total lack of any political party offices—no flags or offices of the ruling and popular National League for Democracy, no presence of the Union Solidarity and Development Party, led by ex-generals: nothing. It seemed to set this place apart from any other in the country. That doesn’t mean that the villagers are not interested in politics. In the Rankhu Center, there are several photos hanging on the wall, just as you find in other Kayan villages. Among them, the main three are: independence hero Bogyoke Aung San; his daughter and the country’s current de facto leader, Daw Aung San Suu Kyi; and the late Kayan leader U Shwe Aye, in that order. My friend told me that those three photos are seen in most Kayan villages and other official places. In Cebu and Rankhu, I saw no pictures of previous and current military leaders like ex-president U Thein Sein or Senior-General Min Aung Hlaing, the current commander-in-chief. He cracked a local joke while steering the car along the dirt road: “We used to say here, ‘We grow mustard seeds, but poppy plants come out!’” We all laughed at this together. A Kayan woman plays a traditional instrument.